Promotional royal blue & white 43” manual open mini fold umbrellas are hugely favored by marketers who love to portray themselves authentically before others. Royal blue is color, which packs lots of authoritative straits and when alternated with white it seeks a tone of elegance. 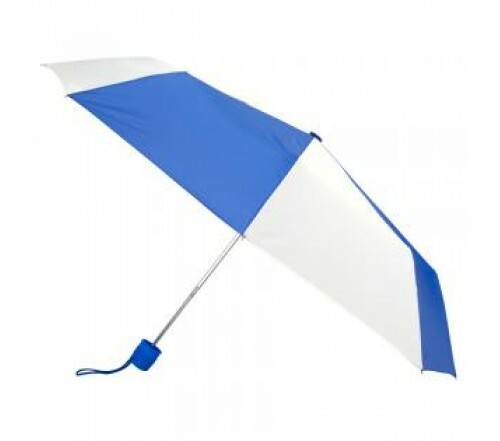 Personalized royal blue & white 43” manual open mini fold umbrellas can be considered for corporate gifting during business meetings or as a part of annual sales driving process. 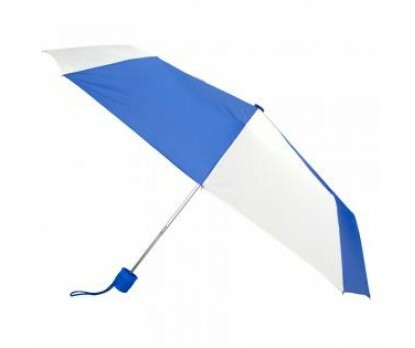 People will be happier to carry custom royal blue & white 43” manual open mini fold umbrellas because it easily fits into their bag, makes them easily noticeable amongst crowd and offers visibility to their business messages in any harsh and windy season too. Features –steel windproof frame, canopy with royal blue and white nylon fabric, rubberized handle and manual open function. Dimensions - 43" arc - Closes to 10". Imprint area - 7"W x 6"H.